Nicely situated in Oberlech (meaning “upper Lech”) you will have ski in/out from this little 3 star hotel – The Almrausch. 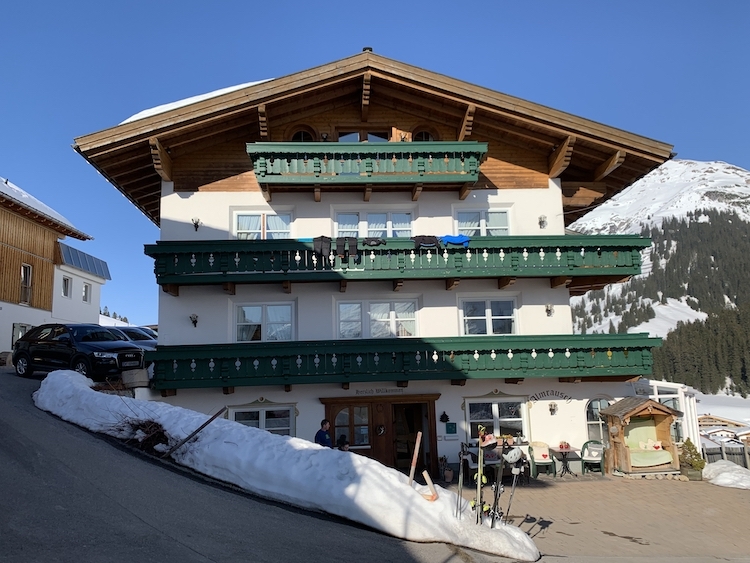 As you will see from our Lech Zürs review (here), this is an expensive area so either you will pay more than your ordinary accommodation, or you will compromise on the standard. The Almrausch is a traditional Austrian gasthof-style hotel – it has a very lovely position high above Lech and with easy ski in/out access to the slopes. The rooms are dated and not of the standard you would expect for the money you pay. However if you are here to ski and not expecting to spend a lot of time in your hotel, this place offers you a good opportunity of affordable “Lech-accommodation”. It is clean and the staff is very friendly – and the restaurant serves really well-made and delicious meals. This is not the traditional fried-everything Austrian kitchen, but something much more inspiring and tasty. Given the fact that the hotel works well with the ski in/out, the nice restaurant and the friendly staff, we will recommend this accommodation for those who can accept a dated look and feel, but appreciates the easy access to the slopes. Next story Does shape matter?